Comfrey contains a substance called allatonin, which promotes cell growth. Comfrey stimulates growth when the system has been traumatized, and is perhaps having trouble regenerating on its own. In particular, it is excellent in treating delayed bone healing, and abrasions and injuries to the skin due to its high mucilage content and its mildly astringent properties. 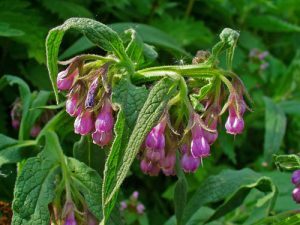 Comfrey also contains a drawing agent, and will draw out stagnant or toxic material out of injured joints, muscles, and tendons. Comfrey helps to increase the movement of fluids to joints. It is highly recommended that comfrey is used externally only, and in combination with other herbs. The dried root can be infused in an oil to be used on its own or in salves on the skin. Additionally, the fresh or dried root can be combined with a small amount of water and made into a poultice, to be applied directly to an injured area. Cautions/Contraindications: Comfrey (root and flower) contains pyrroizidine alkaloids, which can cause liver damage. Use externally, in small doses, and when the liver is healthy. Not recommended for use when taking pharmaceutical medications that are metabolized by the liver, including oral contraceptives. Not to be used during a healthy puberty. Do not use to increase bone growth until the bones are set in the correct place.